Pest description and crop damage Earwigs are elongate, flattened, reddish-brown insects about 0.75 inch long. They are identified easily by the forceps-like pincers on the end of the abdomen. Adults have chewing mouthparts and are winged. 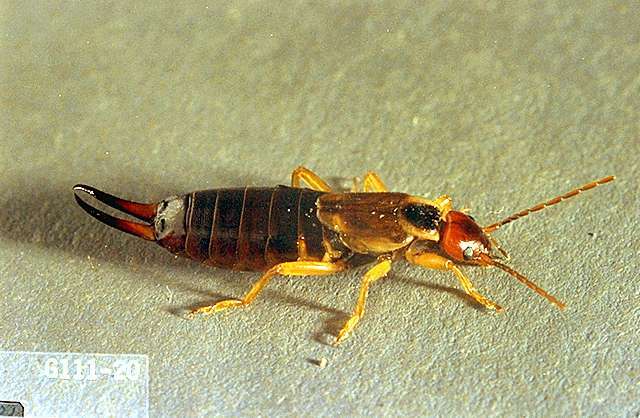 Young earwigs (nymphs) are similar in appearance but are white to olive green and lack wings. Earwigs are harmless to humans or animals, though they may give a slight pinch with their forceps. They can emit a foul-smelling liquid if alarmed. Earwigs feed primarily on decaying organic matter and are quite beneficial in that they also consume other small insects. However, they are found in ornamental and vegetable crops and will chew small holes in the leaves and fruit of stone fruit. 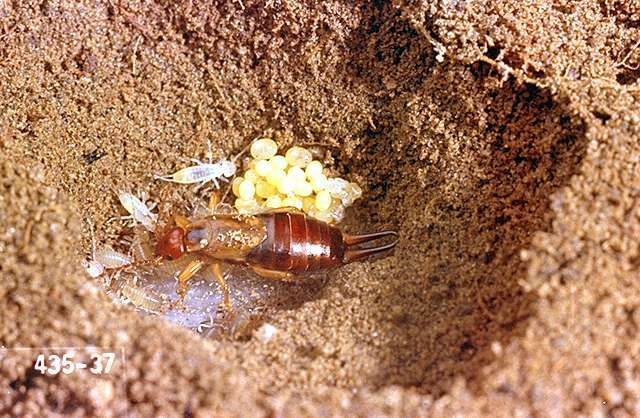 Biology and life history Earwigs overwinter as both eggs and adults just below the soil surface. In spring, females lay 20 to 50 smooth white to cream-colored eggs in the soil. The young progress through partial metamorphosis to adults by late summer. In fall, females may lay more eggs. Earwigs are active at night. During the day, they hide in moist, shady places such as compost piles or beneath stones, boards, and debris. They sometimes can be found in homes, particularly in summer, but they do no damage to house or contents. They rarely fly, but can move rapidly or can be moved by lumber, cars, luggage, or other means. They are attracted to lights at night. Pest monitoring Home orchardists: If damage to young leaves is seen, the presence of earwigs in the garden can be confirmed by placing a sheet of corrugated cardboard, hollow bamboo cane, sections of old garden hose, or similar material on the ground that will provide shelter in the garden. Check the materials each morning for presence of the insects. Infestations spread slowly, as earwigs rarely fly. Home orchardists: Cultivation of the soil in early spring in areas where earwigs are present will disturb nests and expose eggs to predators. Do not allow debris and decaying organic matter to accumulate in the garden. Earwigs can be trapped by using Tanglefoot, "Stickem," or a similar material applied to the trunk of the tree to prevent their crawling up. Before emergence of the nymphs, wrap the trunk tightly with plastic wrap to ensure the insects can't crawl beneath the wrap. Apply Tanglefoot adhesive to the plastic wrap, not the tree, as the adhesive can soften bark. Remove these bands before winter. Earwigs also can be trapped and removed following the monitoring techniques described above. Empty traps each morning into a pail of water topped with detergent. Earwigs are attracted strongly to fish oil and to some extent vegetable oil. Insects can be trapped by filling shallow containers with the oil and burying it in soil up to its rim. Tachinid flies are predators of earwigs. carbaryl-Apply around bases of trees and on trunks as well as under vegetation and on trash. carbaryl (Carbaryl 4L) at 3 quarts/a. REI 12 hr. PHI 3 days. Extremely toxic to aquatic invertebrates; avoid spray drift and runoff to surface waters.